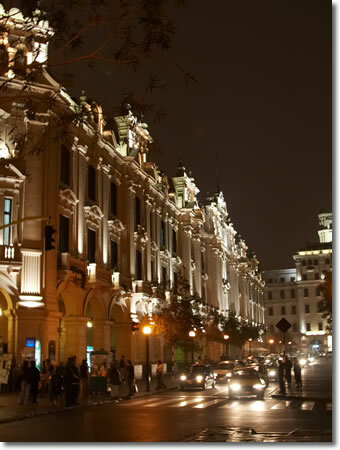 Today Lima, Perú turns 473, and I thought I’d give a shout out to anyone in Lima today and celebrate for the rest of us with a few pictures of Lima. 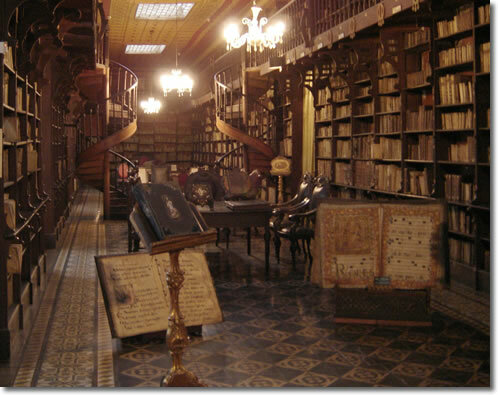 The library at the San Francisco Monastery and Church. Photo by That Other Guy. 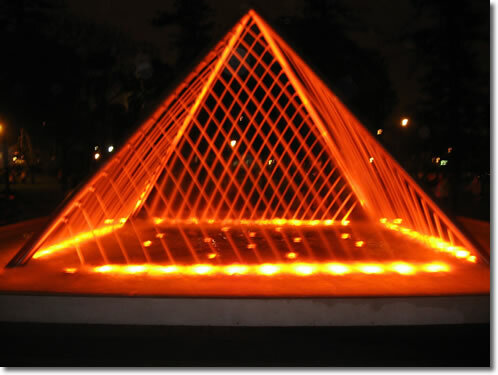 The Pirámide de Agua in the Parque de la Reserva. Photo by Javi270270. This is the Cerro San Cristóbal. Now that’s a lot of houses, almost on top of each other. Photo taken by anaisanais. 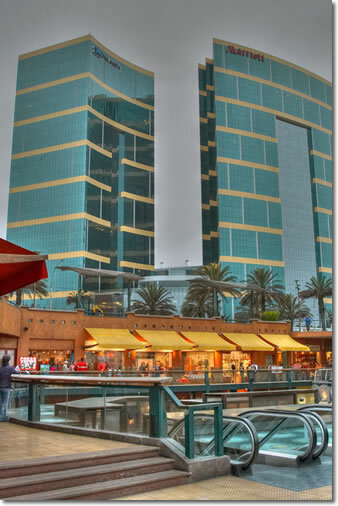 Larcomar is an upscale shopping center in the Miraflores area of Lima. Pictured here with the Telmex headquarters and a Marriot hotel as a backdrop. Photo by Hazelbrae. Plaza San Martín by night. Photo also by Hazelbrae. Some colorful clothing. Photo by TravelingMan. 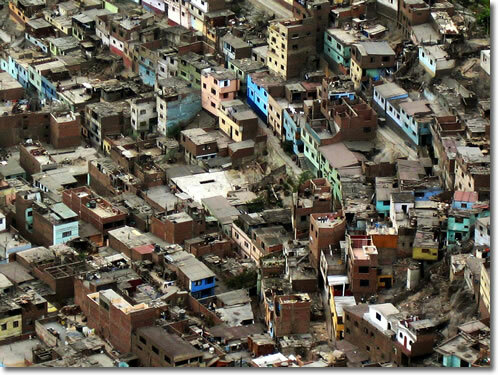 And if you haven’t had enough, you can browse Flickr’s Lima, Peru Photo pool, or take a satellite tour below. 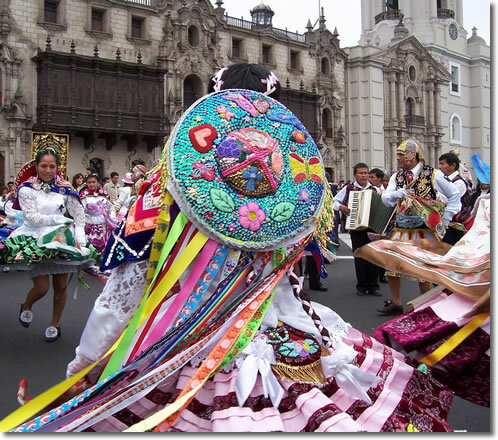 Now, can anyone tell me how they sing Happy Birthady or if they have a song they sing at birthday parties in Perú? Residents of Los Pinos, Colombia, including children, use a zipline for their daily commute. There are two ways in or out of Los Pinos– A two-hour hike or a one-minute zip line ride. Eight children use the zip line daily to go to school and return home. There are no plans to build a bridge, because the population of the village doesn’t jusify it. Two separate cables strung across the river 1,200 feet below allow you to come and go, so– bring your own pully, rope, and brake, and away you go! It looks like fun, but I don’t know about doing it every day. The internet has a lot going for it. You can find lots of things to help you in your studies. Video, audio, text, and many other resources can help you learn Spanish. You can find information for when you’re going to travel to another country to practice your language skills. But a word of warning is in order. Don’t believe everything you read on the net. Or at least double-check with some other sources. Here’s some visit Barcelona site that I’d like to use as an example, because it is spreading misinformation about what city is the capital of Spain, which would probably be quite offensive or amusing to madrileños. Barcelona is presently the capital of Spain, and is the 2nd-biggest city in the country. More than 3 million people live in Madrid, the capital of Spain. But the same site has some of its facts right– they speak a lot of Catalán in Barcelona, and there are also a lot of municipal parks there– something even I have mentioned before. So a word to the wise- Leverage the internet to help you learn, but be skeptical about everything you see. Photo by jpl3k on Flickr. Some of my best memories are the food. I’d eat a plateful of french fries slathered in mayonnaise, ketchup and melted cheese. I still remember the tangy taste of a 4 x 4— a hamburger piled high with slightly fermented, shredded cabbage. The gallo pinto is a typical (at least that’s what they tell tourists) breakfast dish that consists of fried rice peppered with whole black beans, topped with a sunny-side-up fried egg. Walking into Grecia, Alajuela, you’ll see a huge red cathedral that towers over the town square. It’s quite an impressive and imposing structure, that would be even more imposing if you didn’t know it is made of sheets of steel. That’s right, no metre-thick stone walls. The outer skin of this thing is made of steel sheets imported from– if memory serves me– England in the 18th century. If you go out of Grecia and head north, you’ll soon enter into real, live jungle, with monkeys swinging in the trees and lots of eyes belonging to unidentified animals staring at you from under the huge tropical leaves. On one outing we rented a wooden boat outfitted with a motor and went where there are no roads. We went downstream on a wide, deep, slow-moving muddy river. For lunch I had iguana meat, which, like any meat you aren’t familiar with, predictably tasted like chicken. The memories blur. Gardens of bushes carved into the shape of animals. A dairy farm on top of a mountain so high that there was still neblina at mediodía. Walking in a park at dusk, among sentinel-like trees whose trunks are painted white. The lights, tastes, colors and even the smell of concentrated vehicle exhaust that won’t dissipate because the cars’ catalytic converters haven’t worked since 1988. 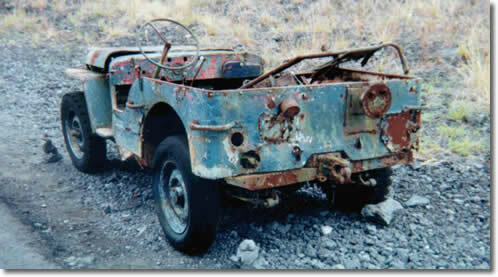 The beat-up green Willys Jeep from about 1940 that I drove a couple of times. I had a great time, learned how to think pura vida, and went from second-year Spanish to communicative fluency. My only regret is I don’t have 3GB of digital photos to prove it all. When you’re traveling out of the country– in some Spanish-speaking country no doubt– you probably use a credit card. I know I do. Nobody these days carries large wads of cash, and somehow traveller’s cheques are not quite as convenient as plastic, especially for things like making phone reservations. But if you do use your credit card, use it sparingly. 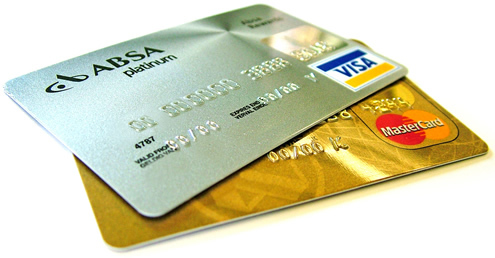 Most credit card companies add a surcharge of about 2% for the privilege of making a purchase in a foreign country. If you add this to Visa and Mastercard’s 1% “currency conversion” charge, you’re out $3 for every $100 you spend. Although this might not sound like a big deal, it can add up, and it’ll come as a surprise if you aren’t expecting it. If you do a lot of foreign travelling, you probably want to find a bank or credit card issuer that doesn’t charge extra for out-of-country purchases, leaving you only with the 1% currency conversion fee. Just thought I’d let you know so you won’t be surprised like I was.